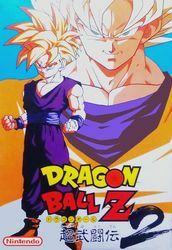 Dragon Ball Z - Super Butoden 2 is a port of the SNES game of the same name, made by Hummer Team sometime during the 90's. This is one of many pirated fighting games on the Famicom. NES to use the Street Fighter II Engine. Unlike most Hummer Team games, it is in full Japanese as opposed to English. The story was completely removed from this version. However, the arcade, versus and CPU vs CPU modes are present. The characters are fought in a random order, and are always fought in certain areas. The graphics and music are taken from the original game and simplified, with some characters sharing stages. Many of the stages themselves use multi-layered scrolling. In Dragon Ball Z - Super Butoden III, most of the backgrounds were replaced, using graphics from Ninja Gaiden III, Super Spike V'Ball, Guerilla War and Contra Force. As well as these, one of the backgrounds in the hack is taken from AV Bishoujo Senshi Girl Fighting. One of the music tracks was reused in Tekken 2, another pirate by Hummer Team. The ending is taken from the SNES game, albeit without the credits.